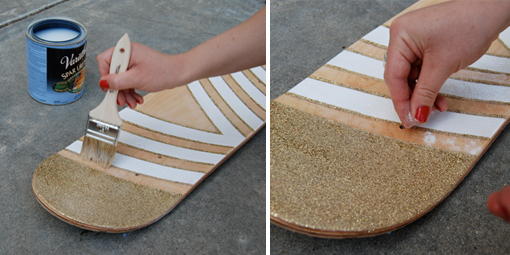 We had such a blast figuring out how to make these gold glitter boards that we decided to share the step-by-step process in how you can make one too! It's a slightly more involved DIY that could take a couple days when considering the drying time and you may need an outdoor or garage workspace - but the steps are easy to follow and you'll love the result. Good luck! 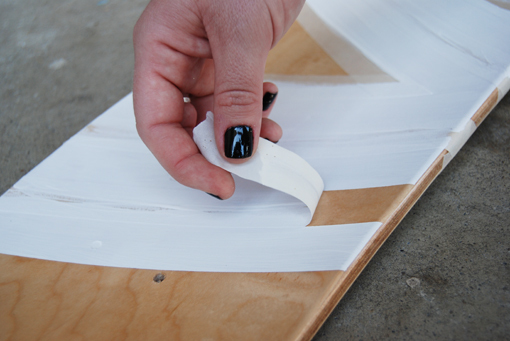 First tape off the pattern you'd like for the white paint (remember the white will go where the tape is not). 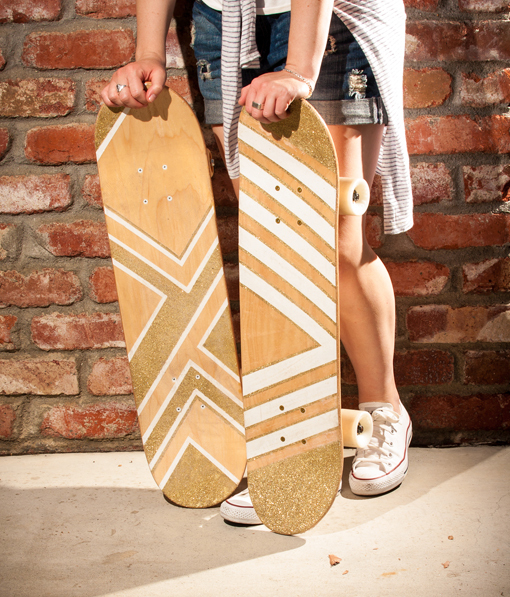 Be sure to tape off the sides of the deck so that there are clean edges all the way around. 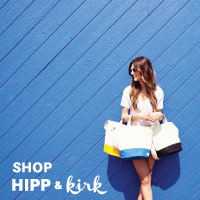 Paint the white. It will most likely need a few coats, so let it dry in between and paint as many applications until you have an opaque consistent finish. Let it dry and then remove the tape. 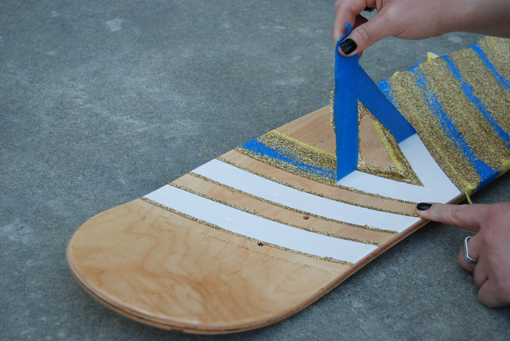 Tape over the white and then tape off the pattern you want for the glitter. 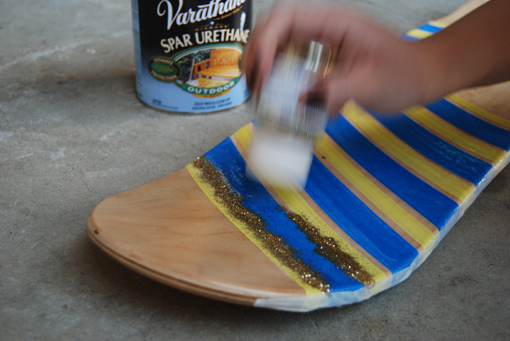 Shake out or pour the glitter onto the wet urethane. 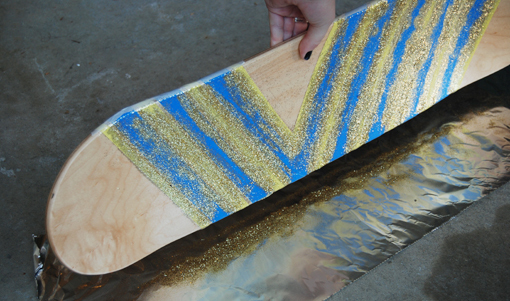 Let dry and then dump off any access glitter onto a sheet of paper or foil. 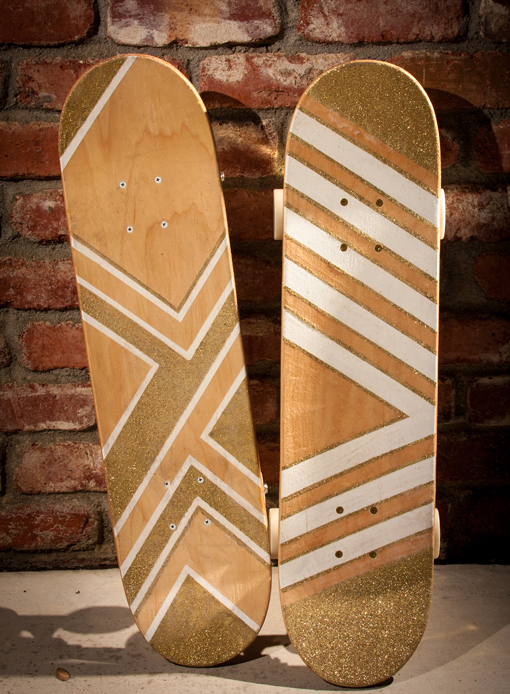 If needed, reapply another coat of urethane and add more glitter in spots that may have been missed. 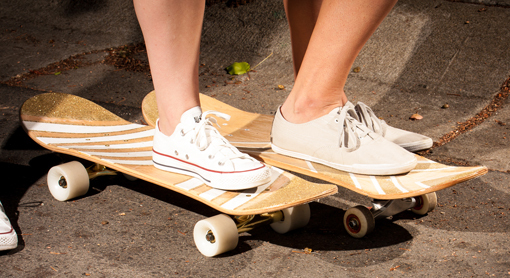 Cover the entire board in urethane. And where there is no glitter dust on the non-skid floor additive. 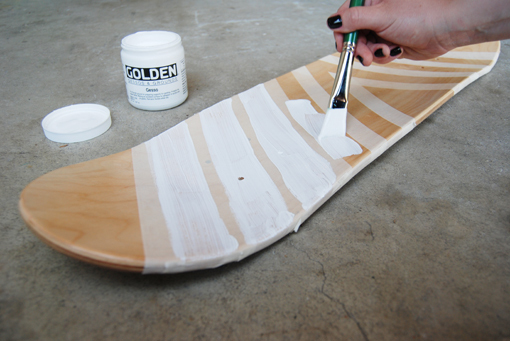 It will dry clear and act as additional grip on the board. 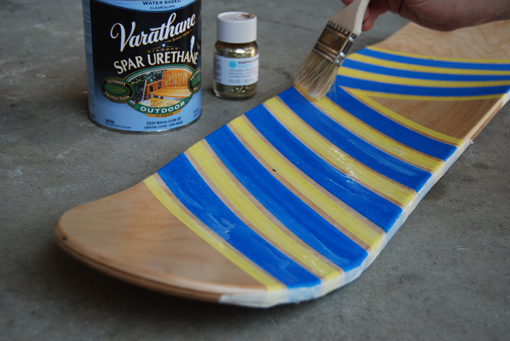 Do a final coat of urethane over the entire board - top and bottom. 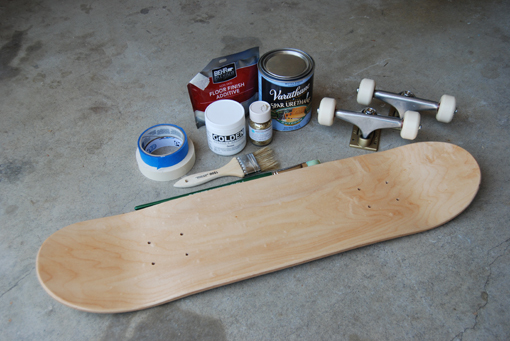 Finally, assemble the trucks and wheels as a standard skateboard would be. (Carissa taught me how since I'd never done it before - so if it's your first board assembly, here's some videos that might help you out)! 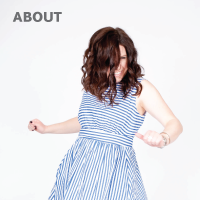 We also painted the underside with a simple white stripe (which you can see yesterday's post). The sky is the limit - so have fun with creating your own unique pattern and colors! Top photo and bottom two photos by Ty. Graffiti art doesn't just mean art we see sprayed on walls. In fact, graffiti art has such strong characteristics that it's easy to spot them everywhere - in schools, on sidewalks, on bicycles, on automobiles, on skateboards and on textbooks, just to name a few examples. Graffiti art has a loose feel about it. Thank you so much. Great find. Thanks again. It means that a creative work. All the riders should know that you can make a great design by your own hand.